Your works are so delicious that I want a full set of cards! MOO cards have become a staple in my studio! They are amazing. The only problem is that I go through so many more cards at an open house that I have to keep buying more! They look sensational Jenny. I love the feel of the Moo cards also. I got some done after my trip to Houston when I realised all the tutors and artists had cards printed with samples of their work. They are a "must have" for the elite Houston tutors. You should sell plenty in your classes. 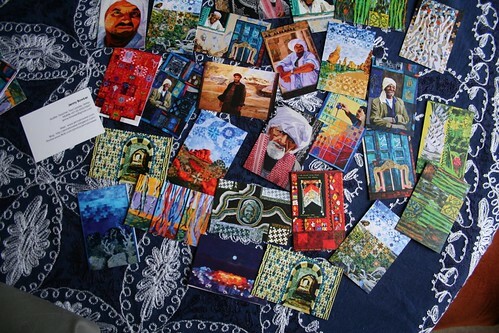 Hello Jenny, those cards look great with your striking quilts on them. They have prompted me to confess that once upon a time (around 10 years ago or so) I undertook to copy one of your landscape pieces (with the centre image merged into the quilt blocks around the outside). I was ignorant about copyright and contemporary quiltmakers, and kept coming back to the image of your quilt (I think it was in a Bernina ad; not sure if you were mentioned as its maker - perhaps in very fine print). My conscience is somewhat appeased by the fact that I only got as far as writing up a detailed fabric shopping list and buying the first fat quarter. I wouldn't dream of copying a quilt now, but still find your work most inspiring! Hope you enjoy Houston! 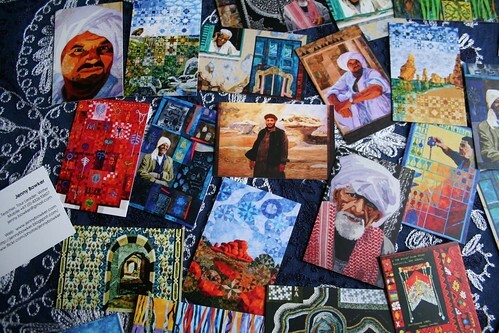 I am an Egyptian writer , I am having my first issue of my new magazine printed shortly, and I have an article about the wonderful story of Goha, his son, and the donkey, and I fell in love with your quilt that show that story. I would like to ask you a favor if you agree that we publish that photo in my magazine next to that article and we will write that this photo was given to us as a courtesy from Mrs. Jenny Bowker and we can also mention your blog. your prompt reply will be so much appreciated. Ruth, I know the quilt and the ad you are referring to! I saw it in one of the first quilt magazines I ever bought, back when I was first seriously starting to quilt. I was surprised that the artists name was not mentioned, and wrote indignantly to the magazine's publisher pointing out this would not happen with any other art. It must have had some affect, as future issues had the words 'Spring in a Sunburnt Country by Jenny Bowker' in the top left hand corner. While I never imagined that I could make anything so beautiful, that quilt was certainly an inspiration to this novice quilter.